Lori Jenkins presents to the Building Leadership Team. On Thursday evening the Harrison staff culminated its One Book activity for the year by hosting a wonderful parent night. 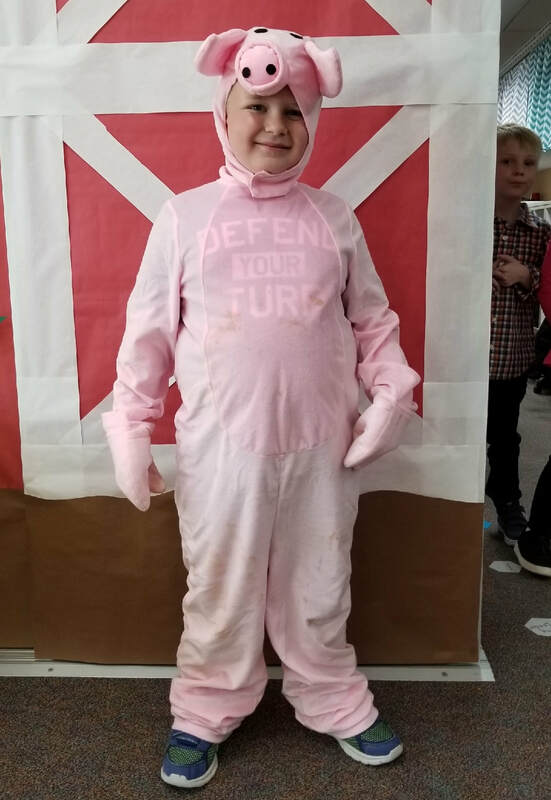 This year's book of focus was the classic children's story Charlotte's Web. I understand Title One Teacher Cassie Norden was the driving force behind this schoolwide effort, but she seems to want to pass along all the credit to classroom teachers who blended Charlotte's Web reading activities into their daily instruction and decorated their pods for the parent night. She also wishes to thank Harrison Principal Marne Autobee for encouraging the entire staff to follow through on the project, for providing program incentives, and for allowing instructional time for the themed activities. Mrs. Norden went on to rave about the many other Harrison staff members who displayed their acting prowess, sorted and tracked daily trivia winners, arranged prizes, sorted and labeled nearly 400 books, created an actual petting zoo (apparently including a live tarantula), sought out an emergency backup popcorn popper, took photos, and generally showed tremendous patience throughout the entire process. I have heard nothing but great things about the effort, and I too want to thank the Harrison staff for this outstanding effort. I'm not sure there is any better way to exhibit our second core belief promoting positive risk-taking than to endeavor on such a project as this! TJ Evagash III is now getting ready for the Invitational Round of the Dot and Dash robotics competition. At our February 12th District Leadership Team meeting, Lori Jenkins from the Children's Advocacy Center took time out of her busy schedule to explain the services and support her organization provides to many of our kids. We very much appreciate Lori's outreach and look forward to tapping into the Advocacy Center's resources to support our first core belief. Several weeks ago I wrote about Harrison student TJ Evagash III's hard work around preparing for the Dash and Dot robotics competition. Two weeks ago we learned TJ actually made it into the Invitational Round. He'll have the month of March to work on a special "Invitational Mission" and will have to submit all his work by April 5th. Talk about a kid who exemplifies our future focus! Good luck TJ! Recreation Director Kyle Horne presents his group's vision work to the entire Civic Canopy group. CCSD board members engage civic leaders to develop plans for attracting and retaining great educators. Lisa Tedesko guides a workplace learning board session. On Wednesday, February 13th twenty-five local civic leaders attended our first of four Civic Canopy community engagement sessions. The purpose of this work is to find ways we can work together to better attract and retain high-quality educators to the Cañon City School District. At this first session, Kelli Pfaff and Jack Becker guided us through the continuous improvement process and took us through paces to begin establishing a work mission. Key themes that rose out of this work include expanding opportunities for children and adults, promoting our healthy intergenerational community lifestyle, highlighting our cultural diversity, and innovative schools, and promoting our small town charm. we'll meet again on March 14th when we'll solidify our mission and we'll begin the work of building action plans to achieve it. This week Cañon City High School submitted a Colorado Department of Education Student Re-Engagement Grant seeking $100,000 to support our Tiger Open Pathways program. If received, the grant will allow us to provide additional staff training in project-based learning, support staffing at the Tiger Open pathway, and cover travel costs for field experience for all TOP students. I want to thank Bill Summers, Andrea Davis and the rest of the CCHS staff that worked so hard on this grant application. Finally, last Friday a group of CCSD educators traveled to Denver to attend the iLearn statewide instructional technology conference. 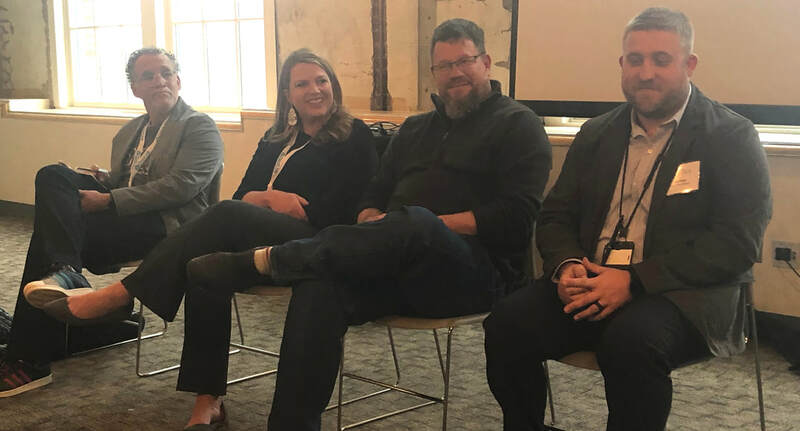 While there, several of our staff presented a breakout session and participated in panel discussions describing how we prepared our staff at Cañon City High School to implement a one-to-one device program. 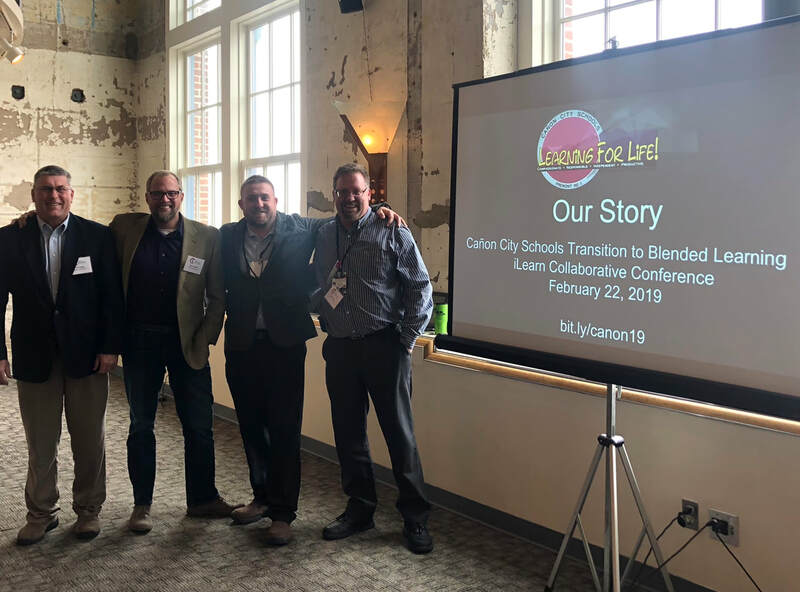 At this year's iLearn Conference Chris Coppa, Adam Hartman, Dan Coppa and Shaun Kohl shared the story of how Cañon City Schools is skillfully putting in place a one-to-one device program. The Lincoln School of Science and Technology staff is appreciative of the work Technology Visioning Committee member Dwayne "Two Chain Dwain" Walter is doing growing its instructional technology program. Last Thursday our Technology Visioning Committee met once again to revise Chromebook use policies, to discuss student monitoring software options, and to begin the process of creating a Technology Innovation Center for the school district. On Friday, many of our committee members traveled to Denver to attend the iLearn statewide instructional technology conference. While there, several of our staff presented a breakout session and participated in panel discussions describing how we prepared our staff at Cañon City High School to implement a one-to-one device program. Meanwhile, on Friday I had a chance encounter with FEDC TechStart Entrepreneurs Brad Rowland, Luke Javernick, and Chris Koehn and they offered up some amazing ideas as to how TechStart might support our effort to establish an Innovation Center. A result of this meeting is that we'll hold our next Technology Visioning Committee gathering at TechStart, and we'll hear the many creative ideas Brad, Luke, and Chris have to offer. CCHS principal Bill Summers and District Instructional Technology Coordinator Dan Coppa served on a discussion panel at the iLearn Conference. 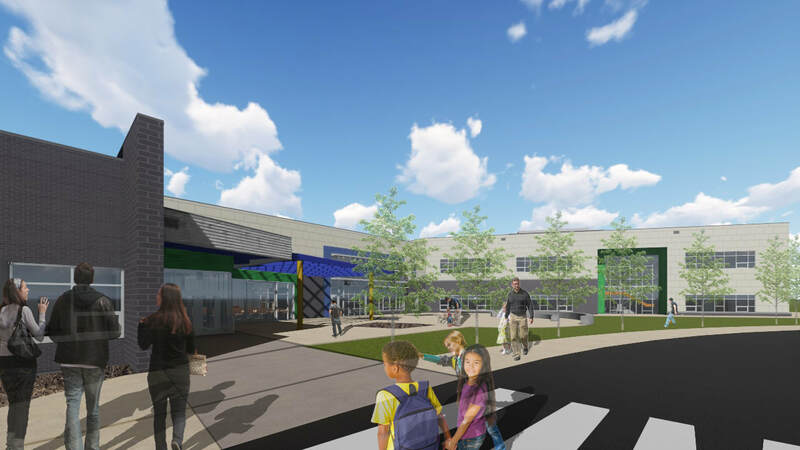 A render of how the front of Washington Elementary might look. A view of the Washington courtyard from the West. As we prepare to start significant construction on the grounds of Cañon City Middle School and Washington Elementary, we are doing our best to address the many facilities access issues we'll be faced with over the next year and a half, especially at CCMS. 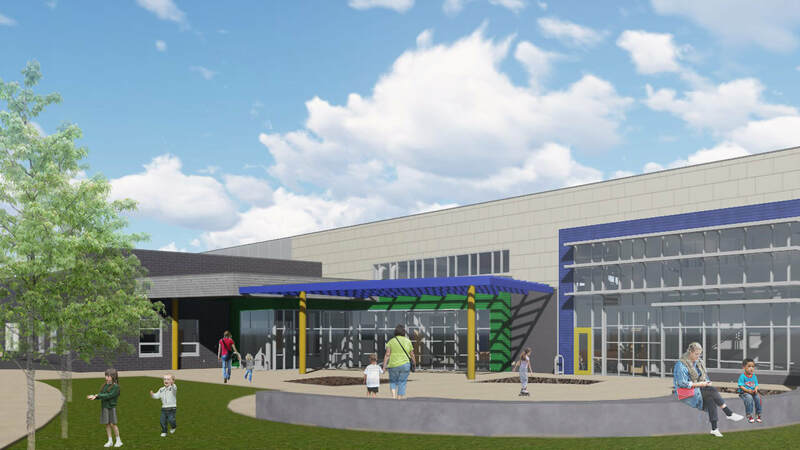 Because a major remodel of the 1970 CCMS gym will begin in April, we'll need to address issues including how we provide indoor PE facilities on bad weather days from August to October, middle-school volleyball practice and game space from August to October, all school gathering space from August to October, and Recreation District facilities use from April through October. We are currently brainstorming ideas as to how we might address each of these challenges, and I'm sure we'll come up with a workable plan on all fronts. Last week conducted mid-year evaluation visits at Harrison K-8 and McKinley Elementary School. We also held a technology vision committee meeting Thursday evening. On Friday I met with folks from FEDC TechStart about developing an Innovation Center, with our health plan provider to discuss renewal costs for the coming year, and with Darcy Cole, the Director of the Boys and Girls Club, to discuss possible early release and no school Friday services they can offer Cañon City students should our proposed calendar be adopted by the Board of Education. 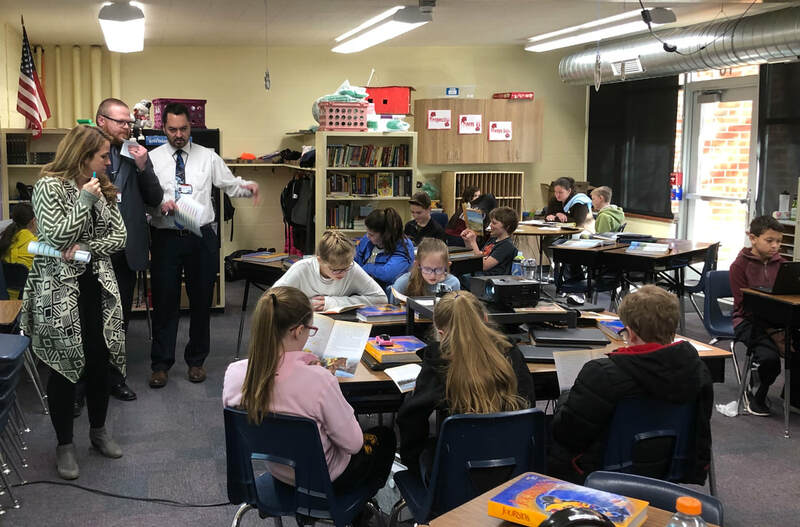 McKinley principal Scott Morton observes instruction with Literacy Coach Lacey LeDoux, and Washington principal Brain Zamarripa while at McKinley. On Monday we'll conduct a site visit for the Cañon City High School mid-year review. After that, we'll hold a board work session and regular meeting. On Tuesday I'll attend a Rural Alliance legislative advocacy videoconference, hold a weekly Superintendent Advisory Council meeting, meet with Fremont County Department of Human Services Director Stacie Kwitek, conduct an Instructional Leader Professional Learning Community, and spend time at the end of the day finalizing mid-year review written reports. On Wednesday I'll start my day on an Opportunity Coalition phone conference. I'll then attend a meeting with our partners at the Southern PeakYout Detention Center, and end my day working on Building Review drafts. On Thursday and Friday, I'll be in Denver for the annual Colorado Association of School Boards Legislative Conference. A large team reviewed the progress of the instructional program at Harrison School. This week we began our annual building instructional program reviews. We do this every year to quantify if each of our schools are living up to the vision they have set out to achieve. These reviews are conducted by a team of administrators from within, and sometimes from outside, our district. On Wednesday we began this work at Harrison. While there we reviewed the progress the school is making toward achieving its improvement goals related to reading instruction, math instruction, and the Kids@Hope culture initiative. We also reviewed current year academic achievement and growth results, observed numerous classrooms across three different 45-minute shifts, and reviewed in depth the work being done through Harrison Building Leadership Team, Professional Learning Community, and Multi-Tiered Systems of Support processes. Some highlights of our visit included recognizing how the staff is on track to achieve their literacy improvement goals, as well as identifying fine growth across the grades through math and reading benchmark testing. Harrison teachers have become quite expert at producing and posting learning targets and we consistently observed high levels of student engagement in learning. We observed the staff using best English Language Arts instructional practices, including expert use of new curricular materials, engaging and leveled small group instruction, and the entire school One Book focus that I described above. We were perhaps most pleased to see adherence to the Kids@Hope culture initiative the staff has been working on, from whole class lessons to parent engagement activities to all-school pledges and constant references to Kids@Hope core beliefs. Throughout our visit the hard work taking place by the entire staff at Harrison was evident. Though there are a few things we hope to see the administrative team focus their improvement efforts on, we look forward to continuing our work with the current them. On Thursday we shifted our attention to McKinley Elementary School. While on-site there we reviewed progress being made toward achieving instructional improvement goals, observed classes in three different shifts, and reviewed the work being done through various committee processes. We also reviewed staff climate survey results and comments made to guide leadership improvement. Highlights included seeing solid evidence of the school technology starting to pay off for children. We were very impressed to see kindergarteners engaged with learning apps, 4th graders writing computer code, and high engagement resulting from students using their devices in creative ways during core classes. Throughout the school, we also saw purposeful teaching, especially when it comes to using best literacy practices related to small group reading instruction. We also observed a very natural use of student engagement strategies in many classrooms, and every class we entered had evidence of a learning target aligned with our curriculum. Additionally, all levels of instructional employees were deeply engaged in work with students at all times. Our visit to McKinley tremendously raised our level of hope that the school emerging as an outstanding choice for parents and children.